As I'm an advocate of open source software, the first statistic that jumped out at me was that a full 45 percent of the Android users polled by ICM said they chose an Android phone because it runs on open source software. Sixty percent said Android phones offer more opportunities for customization, and 58 percent feel the platform's handsets are more logical and intuitive to use, ICM reported. Seventy percent of ICM's respondents said that Android phones offer better value for the money, and 48 percent agree that an Android device is a better long-term investment than those on other platforms are. Sixty-one percent, meanwhile, said that the wide range of handset choices makes Android the best mobile platform. Apps were a factor as well. Though a need for better categorization was frequently noted regarding the Android Market, 45 percent of current Android users said the market offers the widest range of apps and 43 percent felt the apps available for the platform are better than those created for other smartphones, ICM found. 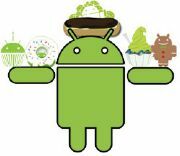 In all, 67 percent of Android users surveyed said they would recommend the platform to their friends and family, according to the report.